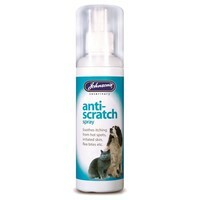 Johnson's Anti Scratch Spray for Dogs, Cats and Small Animals, provides gentle relief for irritated skin. The soothing properties of the spray are effective in calming and soothing areas effected by flea and insect bites aswell as treating hot spots, scrapes and minor grazes. Suitable for dogs, cats and other small animals including rabbits and guinea pigs aged 8 weeks and over. As with any medicated product ensure you familiarise yourself with any additional information provided by the manufacturer before administering this product.